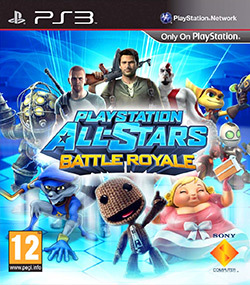 All-Stars Battle Royal is a crossover fighting game released for the PS3 and PS:Vita at the tail end of November. Conceptually similar to Super Smash Bros the game allows up to 4 players to battle against each other using characters from across various Sony games. But whilst been similar to Smash Bros in some respects it is considerably different in others. Opponents can be defeated only through the use of super moves. There are three levels of super move, each one progressively better than the last. Power to use these moves is earned through damaging opponents and also collecting power orbs which are released by certain attacks and also by items that generate during the match. The more power you earn the better your special and if you use a special move of any level the power bar resets to empty and you must begin collecting power again. The special moves vary wildly from character to character and for the most part tie in well to the game they are from or to their personal character. There are a few I haven't managed to fathom yet, but I am sure there is a reasonable explanation for where they spawned from. Often the specials will contain an element of comedic value, a theme that runs strongly through the entire game, which helps the players getting destroyed by it to have a laugh as well as dying. The standard play mode consists of 2 to 4 players battling it out, this game mode is used for on-line ranked battles as well as local battles between friends or against bots. In this game mode, as well as many of the other 'kill based' modes/challenges, a kill earns you 2 points whilst a death looses you 1. The mode is simple but effective, allowing for an extremely entertaining game despite its fairly simply sounding delivery. The bots can be set at various levels of difficulty so you can customise how difficult your game is, also there are many sub-modes to the standard battle mode such as free-for-all, team battle and points based matches where it is first to a set score. Also included in the game are challenge and solo-story modes. Each character has their own story mode where they battle through various opponents to reach a 'boss stage' where you must defeat Polygon Man (the former mascot for Sony Playstation in North America). The story often contains comedic conversations between characters as well as brief cut scenes which bring a story element to the fighting. The challenge modes consist of two lists of challenges; the first being set challenges with set characters that can be completed on any of three difficulty levels, the second being a set of challenges that can be completed with any of the characters (players choice) and on any of the difficulty levels. Both of these modes work well, the story mode does what it says on the tin, adding a story to the game rather than it just being a string of fights against progressively harder opponents. The 1st challenge section forces you to use various characters, meaning you get to use ones you might not necessarily choose but which can still be fun. The 2nd challenge section lets you hone your skills with your favourite characters, learning the best combinations of moves and also sometimes picking up new ones you didn't know they had. Both modes are a brilliant addition to the game, allowing for hours of game play when your friends aren't available or, science forbid, the internet is down. There is nothing quiet like slapping your mates character round the face with a sturgeon and sending them rocketing across the level to put a smile on your face. It earns you a nice bit of power as well! The levels, or battle arenas, can often combine elements from multiple games and can also be interactive; with destroyable sections, changing layouts and also dangers that can damage players and sap their power. One example is the the level Stowaways, which is based on a mix of Uncharted and BioShock:Infinite. There are currently 14 battle arenas to choose from and 22 playable characters. There is already DLC characters on the horizon for early 2013 and the potential for DLC levels, items and characters in the future is massive. There are so many Sony games out there that have not been included, or have but have so much more to give, that I can see this game having at least as much DLC as there is content on the disc. If not more. Certainly something to look forward to in the future to add to an already highly enjoyable game. Rating: 7.5/10, room for improvement, but a solid entertaining game that has a lot of offer and a lot of potential in the future. Definitely worth picking up! Actually my work mates have been looking for a game like this, I will propose this title as a multiplayer. Yeah I do, its for the PS3/vita only.